On a chilly spring night in September, two tall churches blaze out from the dark in the town centre of Launceston, Tasmania. The first, St John’s Anglican, houses two participatory artworks. In one, Launceston Queen Bee performance artist Edwina Blush drops beads of honey into audience members’ palms. In the other, for local artist Kirsty Máté’s Knit, audiences sit in a circle knitting plastic bags into sleeping mats for the homeless. 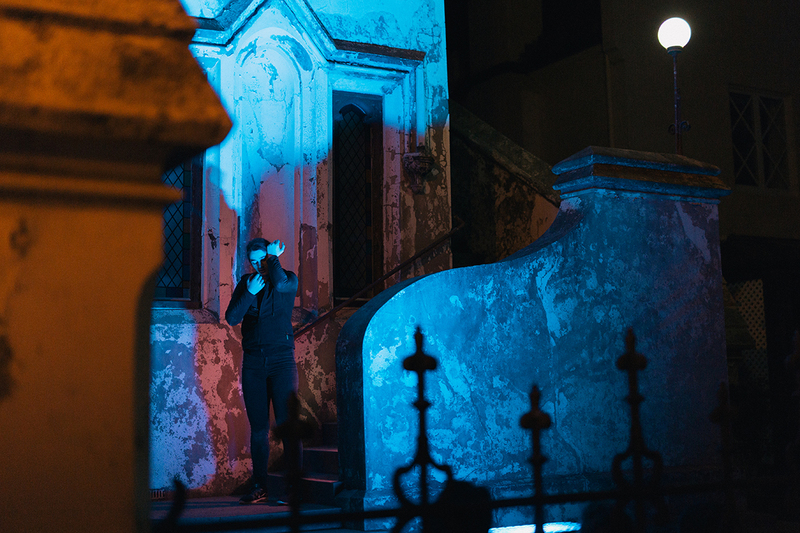 The second, the deconsecrated Presbyterian Chalmer’s Church, across the block, is lit with blue and purple and cast with the shadows of the young performers of Launceston’s Stompin interacting with the church facade twice nightly in Brisbane choreographer Liesel Zink’s site-specific SYCP2017. 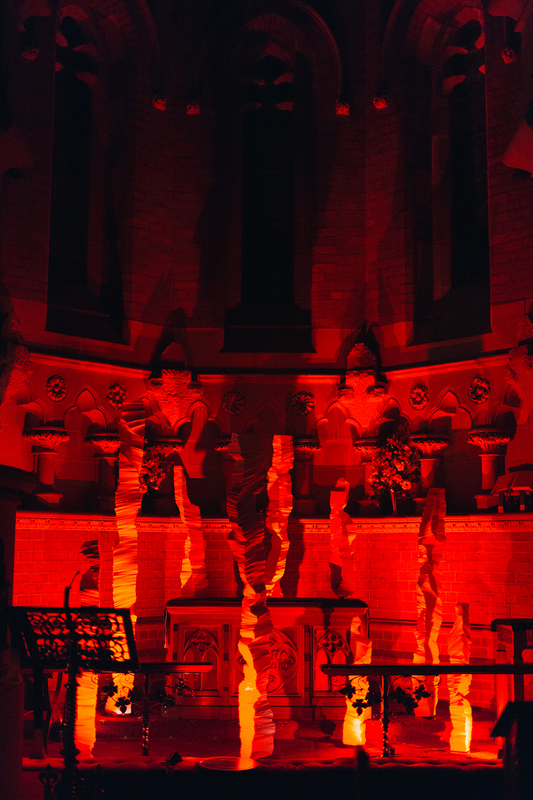 The sight of these churches, otherwise conventional, Gothic spaces, repurposed for ephemeral, whimsical, site-specific contemporary art projects and thrown with vivid coloured light, perfectly captures the essence of Junction Arts Festival. Not merely staged in Launceston, it comes directly from the small but engaged community of its valley town. Junction is a grassroots festival that feels genuinely alive and without the PR gloss of many of its mainland counterparts. The festival takes place at a moment when the state of Tasmania is at its own junction. As Australia’s poorest state, one third of the island’s residents rely on some form of welfare and the workforce is split largely between tourism and hospitality, logging, mining, and government (over 50% of the state budget comprises public service wages). While uber-rich arts patron David Walsh’s Museum of Old and New Art has tilted Tasmania’s reputation (and economy) into a more positive space, continued mining and logging threaten to extinguish the very environmental beauty that the state’s growing tourism sector is founded upon, not to mention its ecological equilibrium. In a place where colonial history feels close to the present and the contradictions of late industrial capitalism seem more visible than elsewhere in Australia, the thoughts and actions of artists — and the broader arts community — have surfaced as genuine stabilisers of the economy. Where the impact of arts festivals in the major cities can be diluted by sprawling urban populations and competing events, regionally focused ones have the potential to really electrify their communities. Walsh’s Dark MOFO pitches itself as a Gothic festival at the end of the world, while Ten Days on the Island festival also draws international and local artists into its program. Junction has no such pretensions — it locates Launceston’s local community at the centre rather than the edge of the world. The difference is about more than marketing speak. Junction has strategically switched from spending money on mainland and international acts to largely filling its program with local, Tasmanian artists. Though this year’s program is smaller than before, it’s oriented directly to Launceston citizens, whose demographic seems to be distinctively family-oriented. 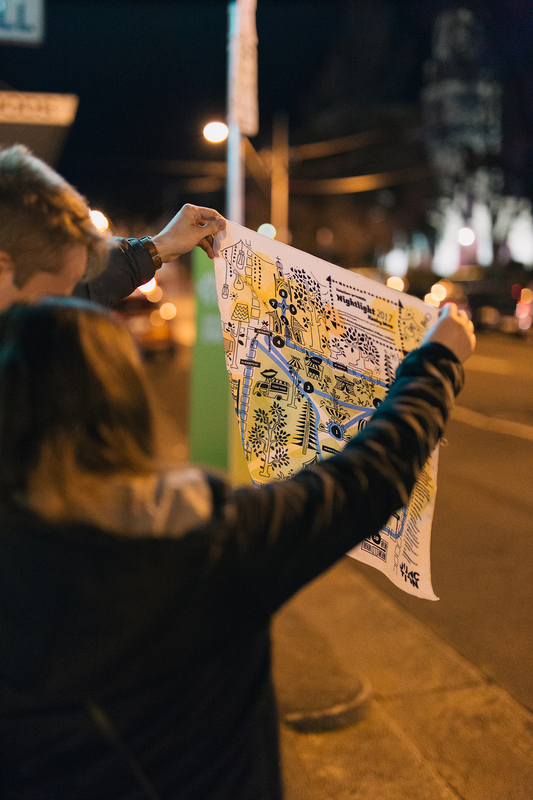 By basing itself in the centre of Launceston, with a large program of free events (nightly music, live comedy, self-guided art tours, light shows, a big public bar), Junction has been able to draw to it a reservoir of goodwill from local artists and community members. 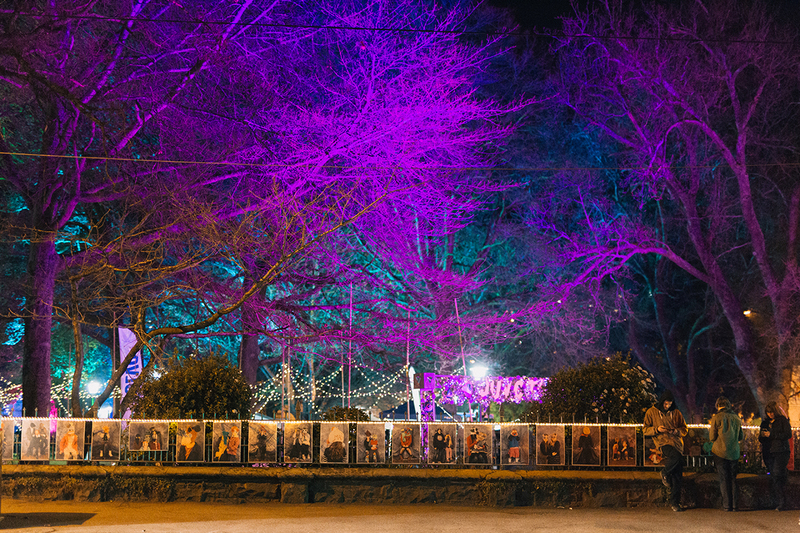 The Nightlight program — a self-guided tour of site-specific art happenings in shops and other spaces surrounding Prince’s Square — provided the most interesting glimpses into Tasmania’s visual and community arts, including a wonderfully loopy community-photographic art project by Team Textiles called Masked Family Portraits, which lined the square’s north-eastern fence in a strange, friendly greeting to passers-by. In St John’s Church, the treatment of young Tasmanian designer and architect Paul Murphy’s Traces, hewn from styrofoam resembling delicate rose quartz and rendered in homage to seastack (geology) formations in Lake Pedder, was an illuminating example of how site-specific context can bring an artwork fresh energy and meaning. Cast with red light, the crystalline pillars formed their own, new conversation with the church’s vertical columns, and it became impossible to think of them installed conventionally in a pristine white cube gallery. Uta Uber Kool Ja provided the most lasting impression of the festival — of solidarity and community through live art. 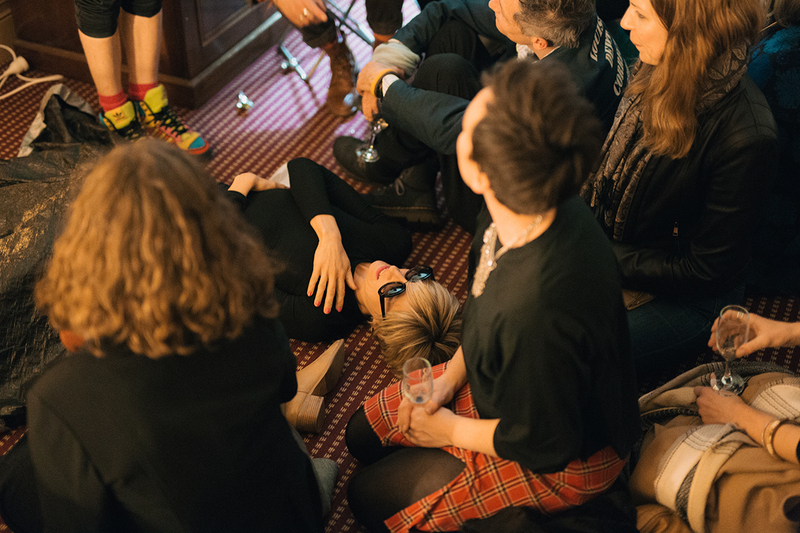 The concept, by actor Georgina Symes and performer and activist Nic Holas, is to use a hotel room as the stage for a new kind of intimate and immersive participatory performance, hurling the audience into an after party in the private suite of a rock star at Launceston’s Hotel Grand Chancellor. Desperately glamorous Uta Uber (Symes) is the centre of attention, and our host is her manager and confidant George (Holas) whom we meet in the hotel lobby before shuttling upstairs to the suite. We’re given glasses of bubbly and a warm welcome, but rather than the glitzy affair that’s promised, Uta has passed out behind the bedroom door on the other side of the suite. Once she rouses herself, it becomes clear she’s not the star she imagines herself to be. As she nostalgically recalls lost relationships with those more famous and important than her (Michael Hutchence), shines the dull glitz of her once-almost-sparkling career (her biggest hit made the top 20 behind the Iron Curtain) and launches a new remix with the lights out (dancing to the DIY strobe of a torch held by an audience member), we realise that Uta is a lot like a former child star — someone who’s been told she’s very special, only to be left dejected and prone to inflated overcompensations. But the show has the utmost respect for Uta’s has-been status: a theme of overcoming failure — by building resilience and stitching together your family — comes into focus as the audience is brought into the bedroom, the suite’s inner sanctum. Uta’s journey is honourable for the very fact that she attempted it. Just as Uta Uber Kool Ja’s staging has changed as it has inhabited different hotel rooms across Darwin, Melbourne and Adelaide, its creators are nimble and responsive enough to allow each new moment to shift the show’s content. This particular installment of Uber became a declaration of love and togetherness — of uniting and saying (and voting) yes, even when failure is possible or the outcome you crave is not assured. A hit at mainland fringe festivals, Uta Uber Kool Ja showed me that contemporary performance can be presented to broad audiences in unusual spaces without sacrificing rigour or depth for funny, feelgood vibes. Launceston’s audiences were as respectfully disinhibited and keen to participate as any performance artist could wish for. In his capacity as Creative Director, former Adelaide Fringe director Greg Clarke’s focus is on an outward-looking approach to programming that brings in the general public — indeed, most of the ticketed events sold out. It goes to show that there’s space in the arts ecology for all kinds of curatorial approaches. The mandate here is not a rigorously conceptualised and academic orientation to the insider art world, but a whimsical focus on fun, public-facing art projects that also relate directly to those making work in Launceston. That means for example, that Pronoun, an amateur theatre production of a fairly conventionally conceived stage-play about a trans teenager emerged from the work of students at Launceston College and was as rough-and-ready as you’d expect. But that’s where its charm lay — a more professional production would have likely used polished actors in their 20s rather than the actual teenagers who gave Pronoun its authenticity and rawness. In that sense, Junction has a more inclusive view of the arts ecology — including its local schools, colleges and high school teachers, and a brand new theatre company, Pronoun’s producer Relevant — than many big-city cultural events. Earlier this year, Junction Arts Festival secured $1.25 million in state government funding until 2021. It’s good to know that Prince’s Square will light up again in September for the next four years. Illuminated in fluoro each night and designed by local emerging lighting designer and Launceston College student Ethan Stanley, Prince’s Square didn’t have anything as high-tech as Vivid Sydney, but it’s nice to think of its rainbow-lit trees as emblems of what small Australian cities could more frequently accommodate in terms of welcoming, lively art events, with the will and inclination of councils and policy makers and those within the arts keen to look beyond the east coast metropolis. Lauren Carroll Harris was a guest of the festival.